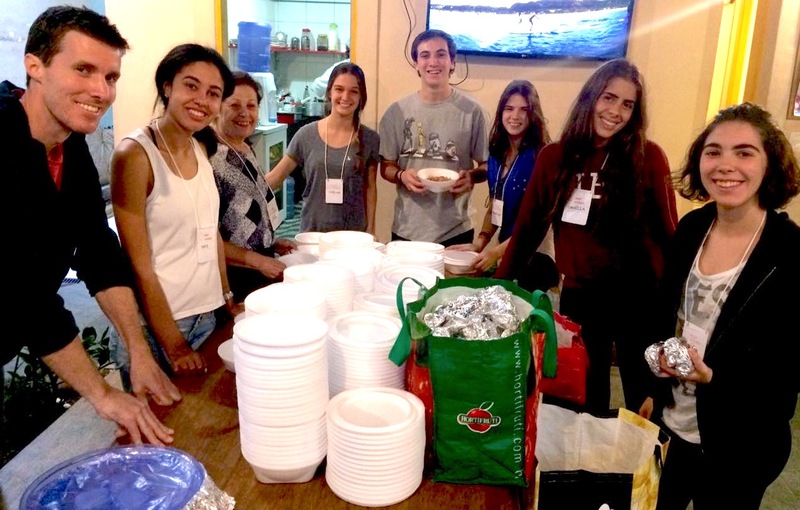 Caminhos Language Center are partnering with the Mango Tree Hostel and The Rio Times to help feed homeless in Rio. RIO DE JANEIRO, BRAZIL – On Saturday, November 24th, just two days after the American holiday of Thanksgiving, a group of foreigners in Rio will be distributing food to the homeless and are looking for support in volunteers and donations. The event is organized by Caminhos Language Centre, the Mango Tree Hostel and The Rio Times. Last year Caminhos Language Center executed the same ‘In Action’ event and delivered clothes and soup to the homeless in Zona Sul and Centro, photo provided by Caminhos. Last year the Municipal Office of Social Assistance of Rio de Janeiro estimated that the number of people sleeping on the streets of the city has increased more than 150 percent in the previous three years. In 2016, authorities estimated there were 14,200 people homeless in Rio de Janeiro. The shelters available today can not even contain twenty percent of that number, according to the secretariat itself, there are 62 shelters in the capital with 2,115 vacancies. The aim of the event on Saturday is to provide food packages to 200-300 homeless people, and the effort will get started at the Caminhos school on Rua Farme de Amoedo 135, Ipanema at 11AM. Organizers Belinda Seixas and Marie Dupuy are quick to point out how grateful they are for Mango Tree Hostel’s contribution. “We had the support of Mango Tree Hostel who offered their venue to prepare the food for distribution and also the famous Tia Maria from the community of Cantagalo who took the reign as Head Chef,” explained Seixas, manager at Caminhos. Last year Caminhos executed the same ‘In Action’ event and delivered clothes and soup to the homeless in Zona Sul and Centro. The idea of the program is one-day projects to encourage people who do not have the time to commit to long-term social projects. “This year we have aimed to feed more people and distribute in more neighborhoods. Last year we managed to distribute in Ipanema and Copacabana and some areas of Centro. This year we would like to extend the distribution to Botafogo, Largo de Machado and Cinelândia. Our aim is to get to as many people as possible,” explains Seixas. One of the chefs cooking food ready to be served to the homeless people, photo by Caminhos. The team are hoping for a long-term benefit from these distributions, by making connections with the people that they serve in order to make them feel like they are cared for. “Some of these people have no families and no loved ones. Our aim is to show them that there is someone caring for them, even if it is through a meal,” adds Seixas. Organizers hope for as many people to volunteer as possible, and urge that those interested bring themselves and friends to the Caminhos Language Center at 11AM. Once there, everyone will get further instructions on how to help for the day. Anyone interested should contact by email at volunteer@maiscaminhos.org, or Whatsapp + 55 21 980732226.